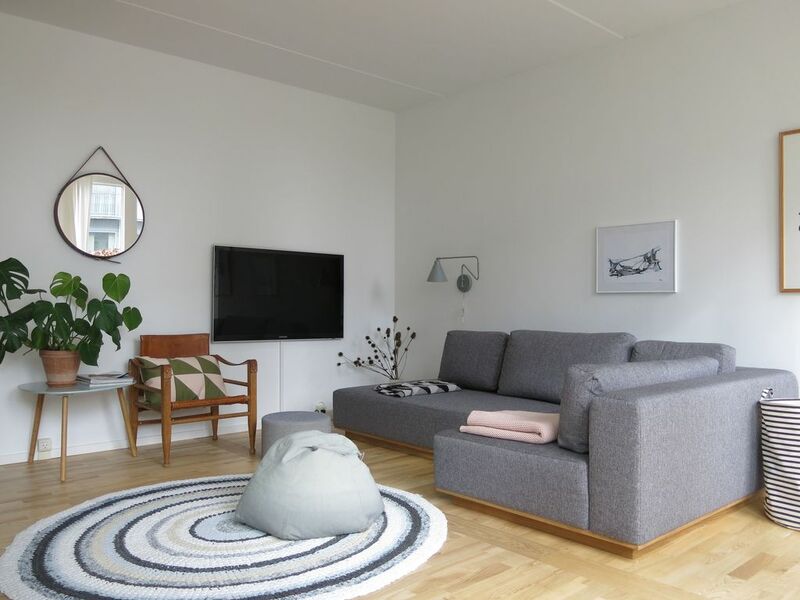 A really attractive modern apartment furnished in Nordic style. The apartment is 115 sq.m. + a 25 sq.m. terrace. Islands Brygge is a great location close to both the city and the ocean. The area has a very charming mix of old and new buildings. This has meant that there are many fun cafés, bars, restaurants, take-aways and shops. During summer, the harbor park is a favourite place among many locals for swimming and sunbathing. Take a walk across Langebro and you will find yourself right in the City Centre. Attractions such as Tivoli, Ny Carlsberg Glyptotek, The City Hall Square and Strøget are all found within waking distance. A great place to explore Copenhagen. Close to trains and bus. A lovely, light, modern 115 sq.m. apartment, beautifully furnished and well located. Remember to check bed size and number of persons before booking this apartment. Hall, large room that contains living room, dining room and kitchen. From here you gain access to the terrace. Adult bedroom with 160 x 200 cm double bed, guest room with 90 x 200 cm single bed and an extra pull out bed 90 x 200 cm. Children's room with 70 x 160 cm junior bed. Combined toilet / bathroom with shower. WiFi, TV with Netflix, Sonos stereo, dishwasher, washing machine and clothes dryer. The apartment is on the ground floor in a building with an elevator. We have spent a wonderful long weekend in the Islands Brygge apartment. The apartment is spacious and has all the necessary equipment. An unexpected surprise was the fact that we could park for free just outside the apartment (we drove to Copenhagen). A supermarket is very close by, the metro station at approximately. 10 minutes by foot. The weather was quite bad while we were there, but we didn't mind spending more time at 'home' playing board games etc. The wifi was superb as well, which was especially great for our 2 teens. Beautiful, bright apartement close to the 'harbour bus' which brings you right to the center of town. Calm neighbourhood, supermarket nearby, all we needed to rest after our long walks.